WASHINGTON: Donald Trump’s administration ramped up the pressure on North Korea on Sunday ahead of a week of high-stakes diplomacy at the United Nations, warning Pyongyang will be “destroyed” if it refuses to end its “reckless” nuclear and ballistic missile drive. The Security Council last Monday imposed a new raft of sanctions on North Korea - but their impact depends largely on whether China, Pyongyang’s ally and main economic partner, will fully implement them and on Russia, which is hosting tens of thousands of North Korean workers. Analysts say that in the event of hostilities, millions of people in the Seoul area - as well as the 30,000 US troops in South Korea - would be vulnerable to attack by the thousands of artillery pieces the North has positioned near the border, with potentially staggering casualties. So far, every effort to persuade the North to back away from its fast-developing nuclear and missile programs - including its most powerful nuclear test yet, on September 3 - has proved futile, at times even seeming to prompt new acts of defiance from Pyongyang. The North’s latest show of resistance came when it launched a long-range missile over Japan on Friday, just four days after the UN Security Council had passed a tough new package of sanctions. At the request of the United States, the Security Council will hold a ministerial-level meeting Thursday on ways to enforce the latest sanctions, which include an export ban on textiles, freezing work permits to North Korean guest workers and capping oil supplies. Haley said sanctions had already provided a “punch in the gut” to Pyongyang but that strict enforcement was crucial. 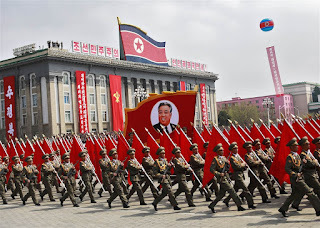 Pyongyang, an insular country with few outside contacts, says it needs nuclear weapons to protect itself from “hostile” US forces and is determined to build the capacity to deliver a nuclear warhead that could hit the US mainland. North Korea said Saturday it was bent on nothing less than military “equilibrium” with the United States. “I spoke with President Moon of South Korea last night. Asked him how Rocket Man is doing. Long gas lines forming in North Korea. Too bad!” Trump tweeted, apparently finding a new nickname for Kim (McMaster confirmed that that was probably Trump’s intention). Whether there are gas lines is unclear; very few people own cars in North Korea, outside military and government officials.